These decorative string lights can transform your home into an intimate, whimsical affair, or a bright spectacle centrepiece for a party. Each set of string lights are lined with aesthetically brilliant baubles, ready to light up your next special event. Choose from a vivid, flashing light effect or thrilling static display. When it’s finally time for candy canes and warm, full bellies, your string lights are the perfect decoration for your Christmas tree. Enjoy a vibrant addition to your living room, at the most joyous time of year. Each set of 20 decorative string lights lights stand at just under 4 metres in length, allowing a range of uses for any occasion. 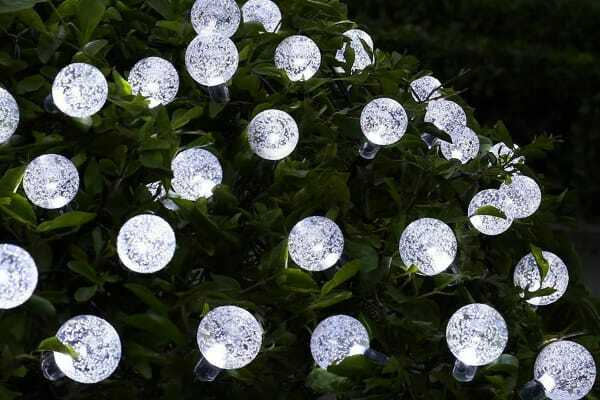 It’s time to illuminate your world, your way, with these solar-powered decorative string lights.